At the 26th International Towing Tank Conference (ITTC), held 28 Aug – 03 Sep 2011, their specialist committee on CFD presented conclusions and suggestions for current and future CFD applications, respectively. Specifically with regard to the difficulties and limitations of CFD that must be overcome to achieve wider use and acceptance, the challenges posed by meshing (cited by 42% of respondents) were a close second to concerns about the accuracy of CFD results (44%). 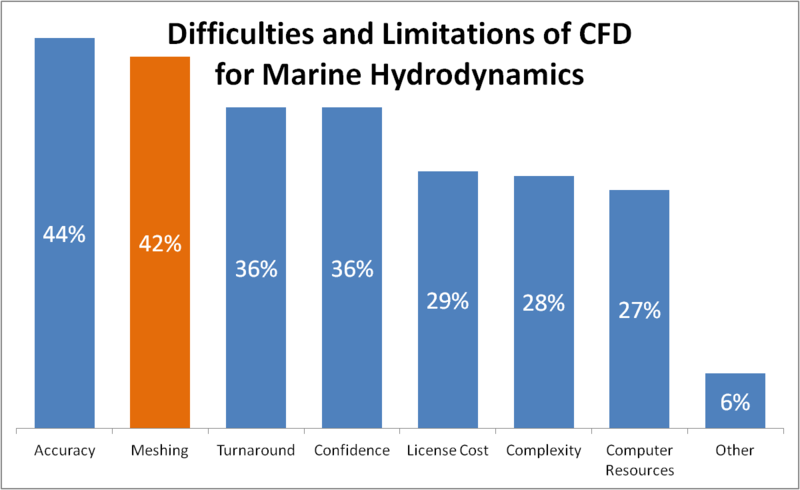 Survey results of 194 marine hydro CFD practitioners across industry, academia, and model basins. Data from the report has been recharted for clarity. The report is not explicit about why meshing ranks so highly as a difficulty but the issue of geometric complexity in the form of fully appended and realistic hull forms is repeatedly mentioned in various other contexts. One can therefore infer geometric complexity as the source of complaints about meshing. Complexity of CFD (noted on the bar chart above as “Complexity”) may also include these concerns and it’s likely that turnaround time (noted as “Turnaround”) is also influenced by the time to mesh complicated shapes. As with most things in engineering, this is part of a good news/bad news situation. The good news is that the application of unstructured, hybrid, and overset meshing techniques to marine hydrodynamics, a field that had been dominated by structured gridding for decades, has enabled the timely application of CFD to realistic geometries. The fact that realistic geometries are also more complex is the bad news side of the situation. Meshing giveth and meshing taketh away. What’s almost more interesting than the meshing news is the fact that practitioners are mostly concerned about the accuracy of their CFD results (“Accuracy”). 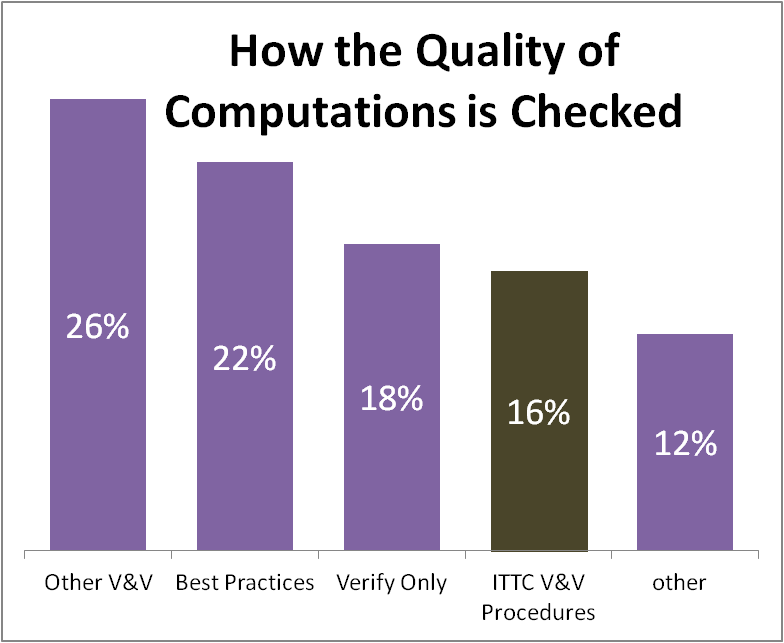 It’s interesting because the survey results indicate that users, 71% of whom claim to be have at least intermediate proficiency with CFD, apply quality checks to computations quite often. In fact, 61% claim to do so “as often as I can.” Yet despite this, accuracy remains the top concern. Methods for checking the quality of CFD computations. Data has been recharted for clarity. Perhaps contributing to this is the fact that these same practitioners use three other quality check methods over the ITTC’s own guidelines. This is not to say that the ITTC has superior procedures to all other organizations or that best practices are somehow faulty but there might be some correlation. After all, the ITTC has a large body of benchmark cases available for validation and verification. However, the report also cites the lack of good quality, detailed data for full-scale and fully-appended hulls as an impediment to future progress. Overall, the report provides fantastic insight into the state of marine hydrodynamic CFD and covers topics from physical modeling (e.g. free surfaces and turbulence) to numerical modeling (e.g. numerical algorithms and grids). This hybrid mesh for the SUBOFF benchmark shows the use of baffles with our T-Rex technique to resolve wakes. 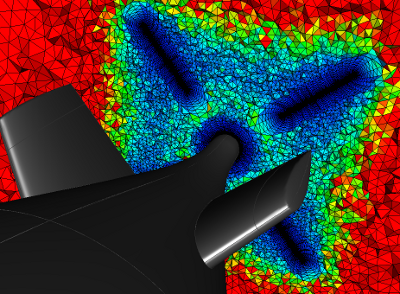 Pointwise has a long history of working with customers on applied CFD for marine hydrodynamics, from surface ships and submarines to hydrology. To see what’s possible, check out the marine applications on our website and then start your no-cost, no-obligation trial of the software. This entry was posted in Applications, Events and tagged hydrodynamics, marine. Bookmark the permalink. Ahhhhhhh, more reports. Who has time for all this reading? I took at very quick look at ITTC’s “Practical Guidelines for Ship CFD Applications” Wow, all words and no pictures, plots, or graphs. Best practices/guidelines can be given with words alone. That being said, for words alone, I thought they did a decent job. But, I did have some issues. The discussion of the first cell height didn’t mention how some turbulence models require cell heights less than y+=1.0. Furthermore, I gather their y+=1 was at mid ship. Capturing the boundary layer further towards the bow may be important. The “Choice of the time step” and “Choice of convergence criteria” needs more substance. And they did not discuss the methods to obtain convergence, explicit, implicit, multigrid, ADI, DADI, DDADI (the last three were for structured grids), SIMPLE, PISO, PIMPLE, etc. So it seems this document was mostly a starting point. It would have been nice if they would have created a wiki out of it, or, added it to best practice guidelines at cfd-online. After all, they did reference the best practice page at cfd-online. And, sometimes it would be nice to see guidelines on what not to do, and why. I agree with you that a wiki would probably have been a better tool for this document than a PDF. Perhaps that’s coming in the future. Plus, I’d consider any best practices document to be a constant work in progress (hence the missing bits and hence the need for a wiki). We’ve discussed the idea of creating some sort of meshing best practices but it’s so application dependent that it’s not clear what general principles could be documented. You’d probably agree that any effort like this to develop best practices for CFD is to be applauded and encouraged. There are so many parallel efforts across various industries that it would be nice to pull them all together to find commonality. Of course, AIAA has the Drag Prediction Workshop, the High Lift Prediction Workshop, the Propulsion Aerodynamics Workshop, the Shock Boundary Layer Interaction Workshop, etc. and other communities have theirs. A lot of best practices are born from these benchmarks. Funkily enough, a worst practices guideline could be very handy, knowing what not to do is equally important as knowing what to do. I agree with you regarding the merit of both worst and best practices. Also, sometimes worst practices are an easier way to approach a problem. In the field of mesh generation the consensus is that it’s always easier to identify a bad mesh than it is to tell whether a mesh is good and its degree of goodness. Plus, writing worst practices might be more fun.